The folks at Orange Mud kindly provided NW Dirt Churners with the just released 2.0 version of their Endurance Pack. I subsequently took the Endurance Hydration Pack for a 7.9 mile run in the Grand Canyon, a 19 mile run in Point Reyes State Park, and some short paved loops totaling 8.1 miles near my parents home in Sebastopol, CA. During each run the pack performed well, with some of my initial concerns around access turning out to be unfounded. In total I ran 35 miles using this pack and my overall experience was a positive one. The straps have three pockets on each strap. There are pockets on the shoulder with a velcro flap closure, and elastic around the opening. 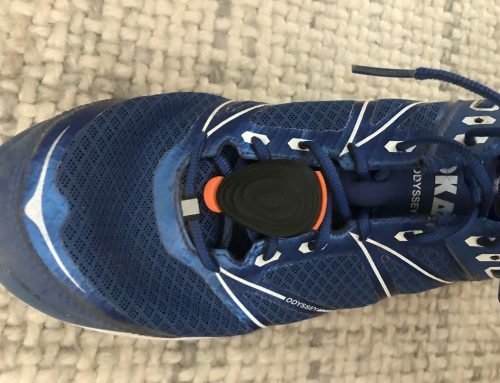 These point out and slight down the strap, can fit multiple gels or a regular size phone quite well. I packed the left one with gels and the right one with a baggy of salt tabs and another baggy of Gin Gins. Next there are two large pockets with drawstring closures large enough to fit a 20 oz water bottle or small gear like gloves, sleeves, and the Territory Bandana. I packed the left one with a UD body bottle, and the right one carried my iPhone 8 Plus as there is no other front pocket that will fit this size of phone. That would be issue number one. Also, the UD body bottle is a little small for the pocket, but Orange Mud does carry the 20 oz Ultraflask from Hydrapack which would be a better fit for these pockets. Further down the strap and on the outside of the large pockets are two smaller pockets that could fit a pair of headphones or additional gels. I used the left one for a pair of headphones, and the right one for my trash. 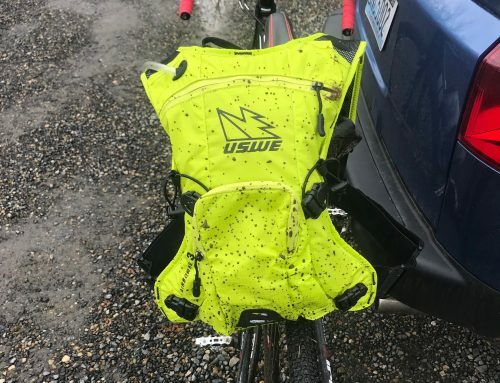 One thing I would like to note about the shoulder pockets before moving on to the back of the pack: On my long run in Point Reyes I packed about 8 gels into one pocket. While they all fit, it was difficult to get one out, and the strap did not conform to my shoulder. With half that amount, everything worked flawlessly. Also, while I was initially concerned that items in these shoulder pockets would easily fall out, that was not the case at all. They are one of my favorite features of this bag as they are much easier to access than the side zipper pockets on my Ultimate Direction AK 2.0 pack. The back of the pack has three compartments. One for the 2L bladder, one that you can easily stuff a light jacket, an additional layer, and some extra food into, and a third zippered compartment that is on the outside of the pack and made of slightly stretchy material. An elastic cord crisscrosses everything on the back, slightly covering the zippered compartment, and can be used to strap down a jacket or other extra layers. 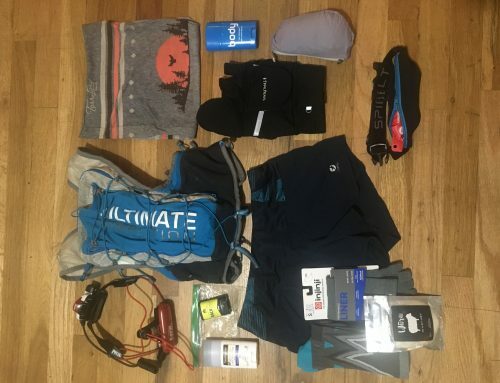 On my long run in Point Reyes I packed some extra food, my first aid kit, emergency blanket, and some Territory Chafing balm in the zippered pocket, and then strapped my Patagonia Storm Racer jacket on top using the elastic cord. 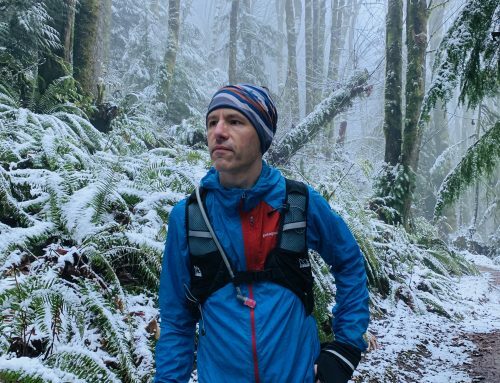 Initially I was pretty sure getting in to that compartment would be difficult and annoying, but after taking the pack off, I simply pushed the jacket aside and easily accessed the chafing balm, and later an additional gel. That was a pleasant surprise. In fact, almost every concern I had had about the functionality of the pack was proved unnecessary after actual use, except for how the drinking tube is held along either strap, which I will talk about later. All that said, I was hard pressed to carry everything I needed in this pack for my 19 mile run in Point Reyes. While the pack is rated at 6L of capacity, up to 2 of those are taken up by the bladder. That leaves 4L of storage in the configuration I tested. There is an add on that provides an additional 4L of storage, but without it I would not be comfortable going over 20 miles with this pack. It also lacked an easy way to carry poles in the configuration I tested, although there is an add on that makes that easier as well. Ultimately I would consider this a great short run pack, as well as an excellent pack for racing. 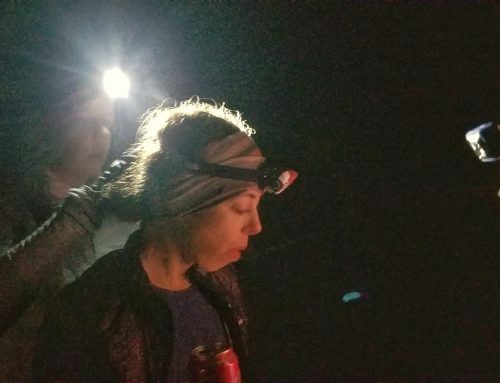 The fact that you can access the bladder extremely quick and easy without removing it from the pack is a huge plus for getting in and out of an aid station fast. In terms of fit and adjustment, the pack sits higher on your back than most, which took a little getting used to. It is recommended to adjust the side straps to get a secure fit and then use the front chest straps to fine tune. These front straps are made with a stretchy material which has some trade offs. While they allow the pack to more easily expand and contract with your breathing, I found that they tended to loosen over time. The best way to readjust was to pull as close to the clip as possible. One thing I did notice was that my shoulders never felt like they were collapsing in as they sometimes feel with my UD pack. I am not sure if this is by design, but it was a nice perk. Also, since this isn’t a vest and has no side pockets, I feel like I am less restricted in my core rotations. And now, the drinking tube. There are two elastic pieces that help route it down either shoulder. That isn’t really an issue. What is an issue is the tube will run over one of the shoulder pockets. While it didn’t get in my way every time, it was annoying enough that I kept wondering why they didn’t add a loop on either side of the pocket in order to secure the tube. Another option could be feeding the tube under the shoulder pocket, although that could feel uncomfortable if the pocket was crammed with stuff and pressing the tube into the shoulder. Also, there is no place to put the tube, so be warned. I highly recommend getting the magnetic attachment that Hydrapack sells as that is what I used. The only other knock against this pack is you have to take up one of the large front pockets if you have a plus size iPhone or larger Android. This isn’t a perfect solution as my iPhone 8 Plus fit at an angle in one of these pockets, which made access into the smaller stretchy pocket on the same strap a little awkward. Overall this pack performed quite well. Like I said above, I would recommend this pack as configured for runs under 20 miles or races under 50 miles. I do want to note here that I tend to pack more than I might need, so someone who tends to be more minimalist could probably push this pack further than I am comfortable with. The issue with the drinking, while at times annoying, is not a deal breaker. The pack was comfortable, did not bounce, and certainly felt less restricting than my UD pack. Orange Mud is a Colorado company, with fantastic customer service. If you are looking for a bag for your next race or shorter adventure, I would definitely recommend giving this one a look. Dimensions: 10″W x 13″ tall / Volume 6 liters.